Times plummeted in the final minutes of Free Practice 3, Valentino Rossi just holding off the Spanish duo of Marquez and Pol Espargaro. 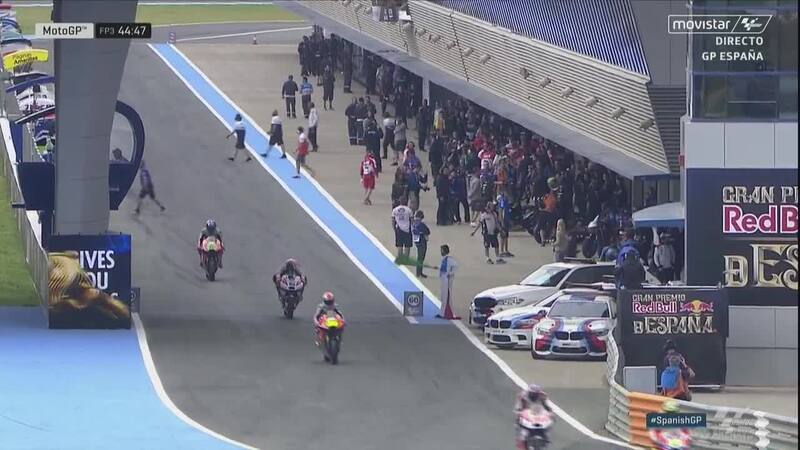 Free Practice 3 has become a very important session for the MotoGP™ World Championship. The 2016 rules have benefitted a number of riders and ensuring a place in the top ten is more difficult than ever. As a result, the final ten minutes of Free Practice 3 are often as exciting as Qualifying itself, riders pushing as hard as they can to guarantee a top 12 spot on the grid by advancing directly into Q2. Conditions were significantly cooler than on Friday, air temperature a brisk 17.7°C and the track at just over 18°C. This benefitted many riders who had complained about a ‘slippery’ track the day before. Two riders who certainly didn’t have to worry about missing out on the top ten were Jorge Lorenzo (Movistar Yamaha MotoGP) and Marc Marquez (Repsol Honda Team). The pair having set the pace on Friday and entered the session with banker laps already in the 1’39s. 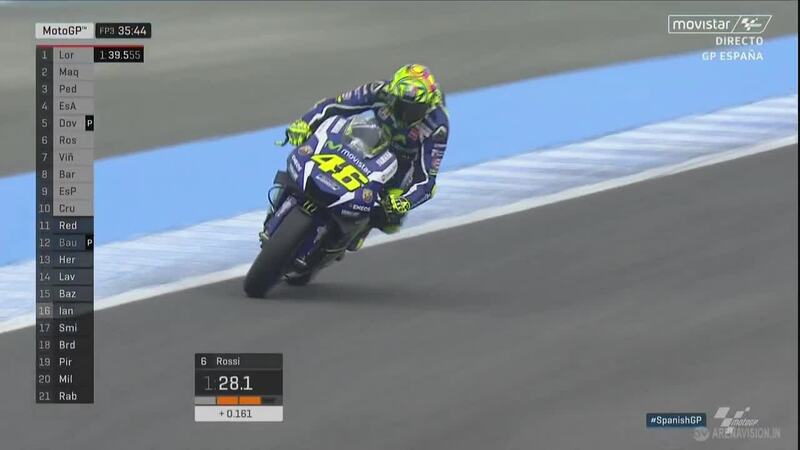 Valentino Rossi (Movistar Yamaha MotoGP) would be the first rider in FP3 to join them in the 1’39s, ‘The Doctor’ quickly dropping almost half a second from his Friday time. Unfortunately the early improvements were not as dramatic for the likes of Andrea Iannone (Ducati Team) who had spent the majority of the weekend outside the top ten. The new construction of the Michelin tyres is quite different to what Ducati tested with at Jerez in November, Iannone struggling to get back up to speed. But slowly the feeling came back to him and lap-by-lap he was able to gain on the leading riders. After 11 laps of adjusting himself and the bike to the new conditions, Marquez began his pre-Qualifying push as a number of sectors flashed red on the timing screens. 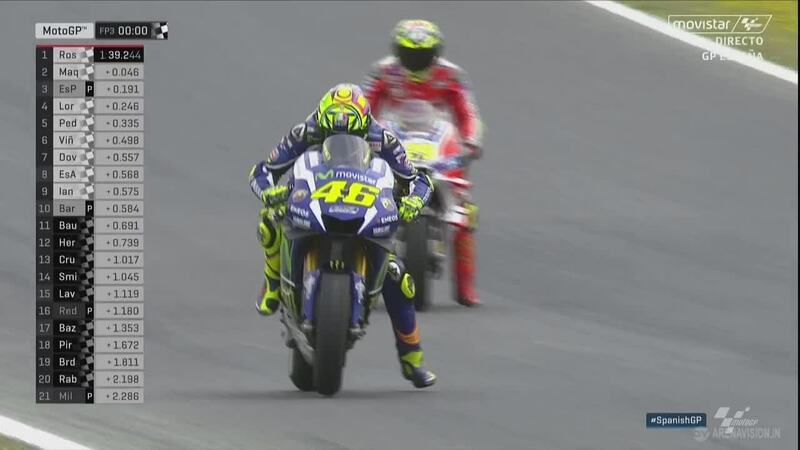 A 1’39.795 was his first effort to overthrow Lorenzo at the top. This also signalled a shift in the session, with 15 minutes left riders returned to the pits to switch from race pace to attack mode. 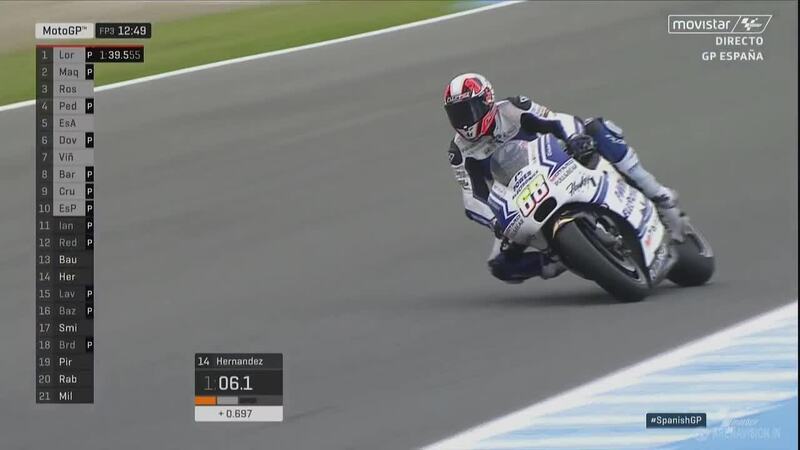 Maverick Viñales (Team Suzuki Ecstar) was one of the first to strike in the final ten minutes as he moved up into third. He soon found himself pushed to fourth as Andrea Iannone finally made a break through with the setting of his Desmosedici GP16. Now the shootout was well and truly on as flying laps saw times tumble. 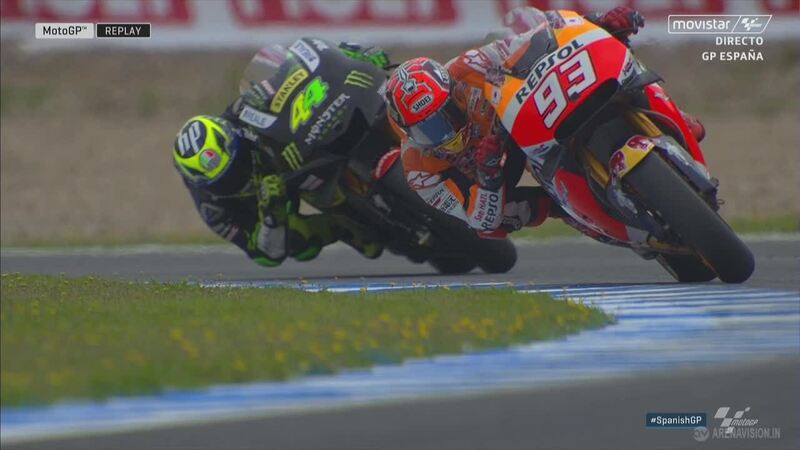 Marquez dethroned Lorenzo at the top, Pol Espargaro (Monster Yamaha Tech 3) took huge benefit from Marquez’s lap to provisionally move into second. The minutes ticked down as the timing screens were ablaze with red and orange sectors, and Rossi shot to the top of the session with a 1’39.244. Try as he might, Marquez would be unable to get back ahead of the Italian. In past years Rossi could frequently be seen struggling outside the top five during FP3 and in Qualifying but ‘The Doctor’ has cured his Qualifying problems. 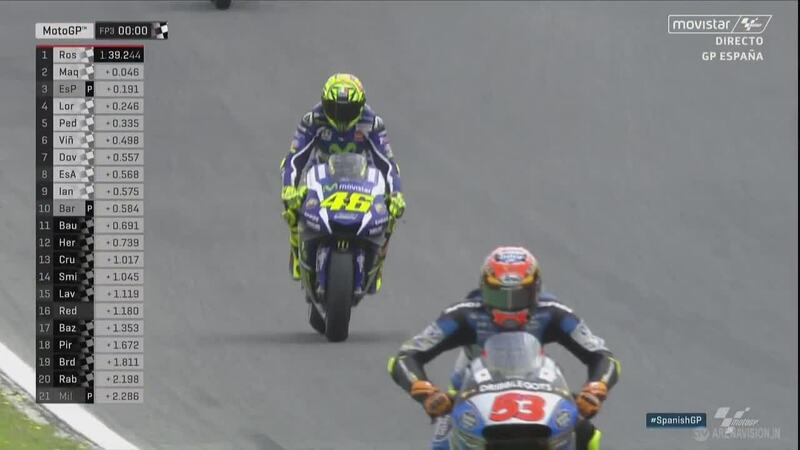 An armada of Spanish riders are close behind Rossi, Marquez 0.046s back. For the third time this weekend, Rossi completed over 20 laps in practice, the Italian having now down over 60 laps in total. 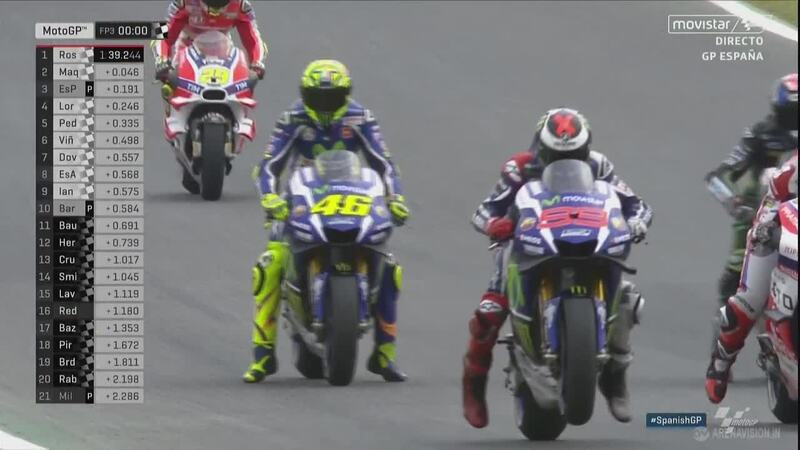 Marquez was unable to go faster than Rossi, his time tantalisingly close. The first three sectors at the Circuito de Jerez present little problem for the Repsol Honda man, but the final sector with Turns 10, 11 and 12 are causing significant problems for Marquez and all the Honda riders. As discussed in Austin, Marquez feels more comfortable around left hand bends and the three fast rights at the end of the lap in Jerez are presenting a challenge. Free Practice 4 will give Marquez and his crew a chance to solve the issue ahead of Qualifying and the race. 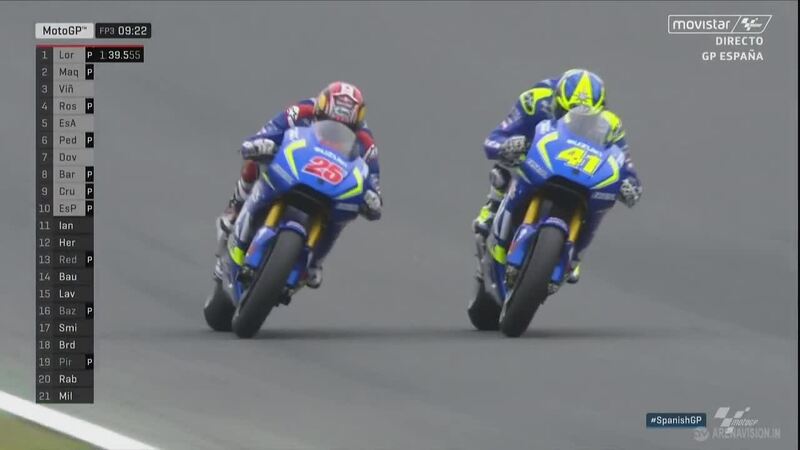 After a difficult Friday, Pol Espargaro was able to grab onto the back of Marquez during one of his flying laps and make significant improvements to his lap time. 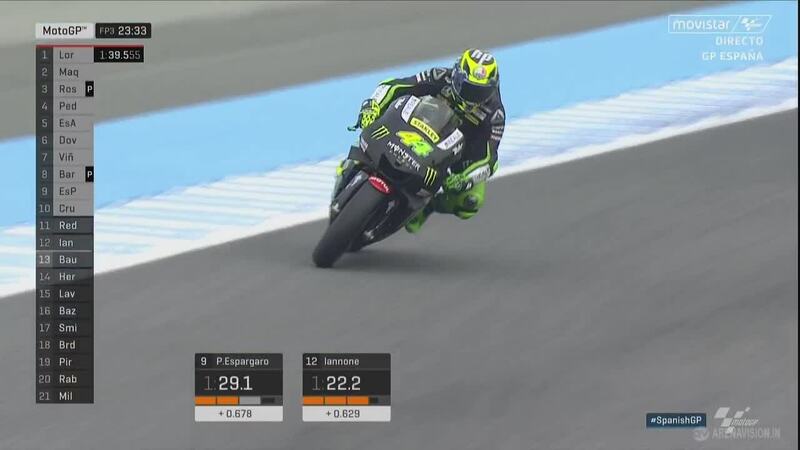 With third, Espargaro guarantees himself a place in Q2 but will need to find some speed on his own to challenge for the front row at his home Grand Prix. 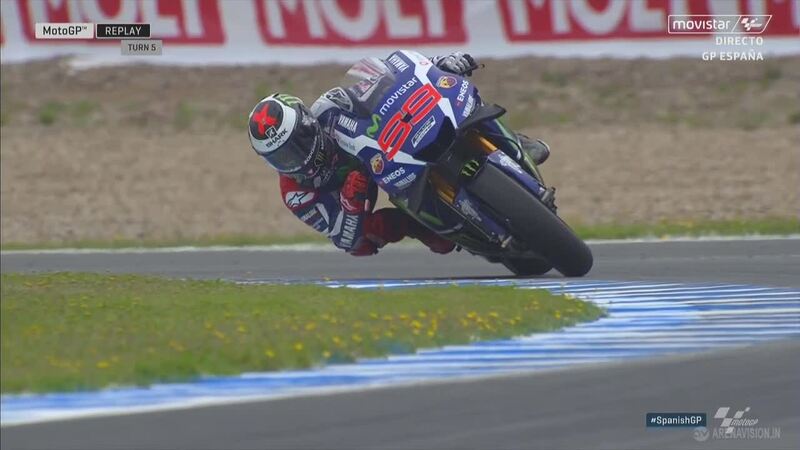 Improvements were small for Lorenzo towards the end of the session. Having led the way on Friday, the Majorcan improved his lap time by under 0.1 of a second and demonstrated he can certainly consistently put in the laps. His 1’39.490 put him fourth in the session and only 0.246s back on his teammate. Over the past two years, Lorenzo has often been able to go from struggling to challenging for pole in Q2. Expect no less from the reigning MotoGP™ World Champion later in Q2. 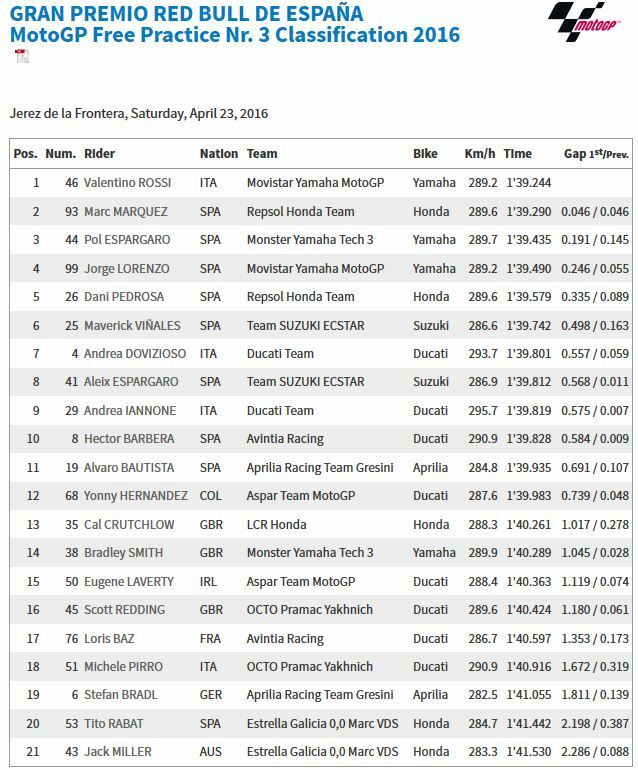 Times are considerably tighter throughout the top five than on Friday, Dani Pedrosa (Repsol Honda Team) improving to a 1’39.579 to head into Qualifying with the fifth fastest time. Like Marquez he was struggling somewhat with Turns 11 and 12. Pedrosa has never finished off the podium in Jerez in the premier class. 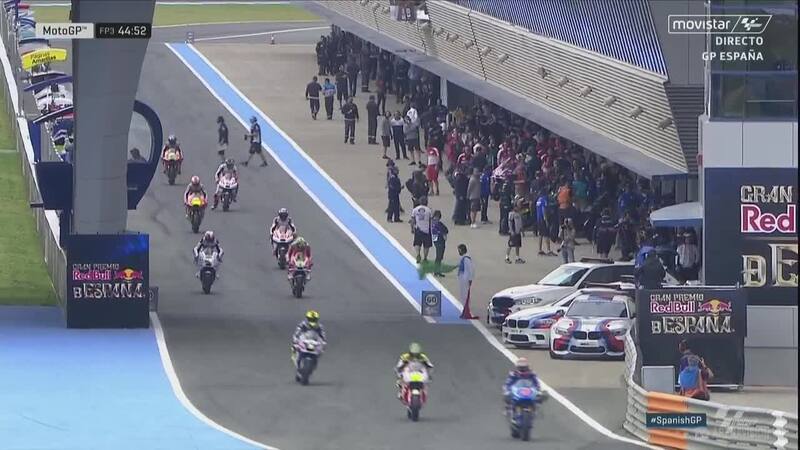 Maverick Viñales (Team Suzuki Ecstar), Andrea Dovizioso (Ducati Team), Aleix Espargaro (Team Suzuki Ecstar), Andrea Iannone (Ducati Team) and Hector Barbera (Avintia Racing) will all advance directly into Q2 having ended inside the top ten. All the British riders unfortunately missed out on the top ten and should produce a fascinating battle in Q1 for the top two spots.